Devil's Arcade wrote: For the ridiculously douche-baggy way that you said it... nah. Making it sound like its a loss to me, which it obviously isn't, can't take a bit of constructive criticism can you? I can take constructive criticism, you never offered it. Also, you are the one that asked... and I answered, you have appeared from nowhere, and have been rude in a few of your 7 posts. I would say more constructive suggestion then, but what's the difference? Your graphics are ridiculously cheesy it be nice to have some that aren't and with the other characters. You appeared from no-where once. What is cheesy about them, then? I did, yes, but I waited til' at least 20 posts before I was a **** to people! Devil's Arcade wrote: What is cheesy about them, then? Everyone of them seems to be silly, you've totally ignored everything that was good about Scrubs and instead focused on the cheesy aspects of the show. So there's a 20 post minimum before I can be a jerk? DA your artwork sums up the style of scrubs perfectly as far as I'm concerned. Two Sides wrote: DA your artwork sums up the style of scrubs perfectly as far as I'm concerned. Right so Scrubs was all about J.D. and Turk? ah righto must of watched the wrong show since 2001. Any suggestions on the show I've been watching? You seem to think I am bad mouthing what "DA" is doing, I certainly couldn't do it but focusing on something so insular and ignoring the other aspects of Scrubs really irks me. Same reason why I hated people watching Scrubs just for J.D. and Elliot. That really irked me too. They're part of the show but not the show. The most important relationship on Scrubs was J.D. and Doctor Cox. Not Turk and J.D. or J.D. and Elliot. You really want to know why it's mostly JD & Turk, because they are the most easily accessible, decent quality images, that can easily be shrunk to fit in to an avatar and not be too blurry, or scratchy. 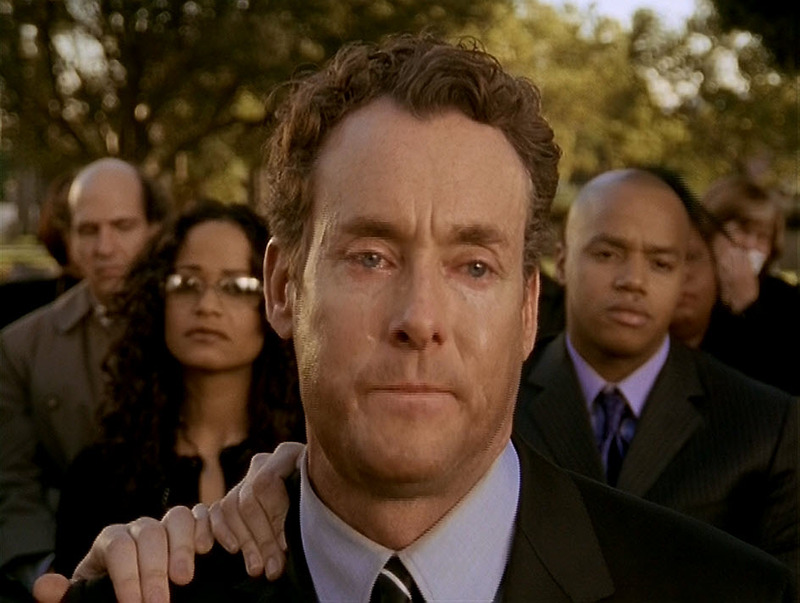 I have been searching for the image of Dr Cox crying at the end of my lunch and My ScrewUp, but they aren't easy to find in decent quality, I don't ignore any aspects of Scrubs, if you were ever around for Scrubs discussions I love it for it's dram and acting, maybe even more so for it's quirky comedy. Devil's Arcade wrote: You really want to know why it's mostly JD & Turk, because they are the most easily accessible, decent quality images, that can easily be shrunk to fit in to an avatar and not be too blurry, or scratchy. I can easily help you get higher quality Doctor Cox images, I have jumped the gun maybe, do you have anyway I can maybe pass some screen shots and press photos over to you? Only trying to help, I see your point now. I can see what I can do, might be a bit to LQ. That's great, want any other images I'll see what I can find.